We eat a ton of cauliflower rice in our house – but, plain ol’ veggie rice with butter gets a bit boring. So, the other night, we decided to take it to the next level. 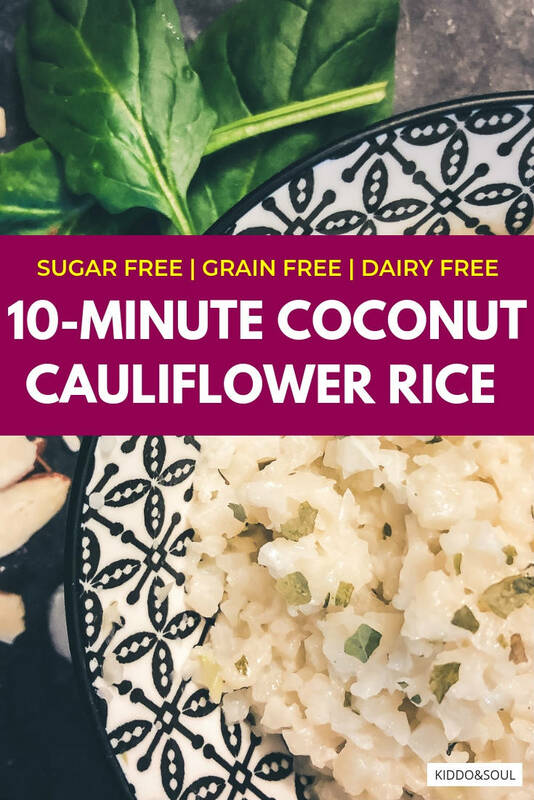 This 10-minute coconut cauliflower rice is sugar-free, dairy-free, gluten-free, grain-free and incredibly addicting. We make it for quick dinners or meal prep lunches! I don’t know about you, but I love it when I can take something incredibly simple and turn it into a dish that feels like it was prepared by a Michelin Star chef. 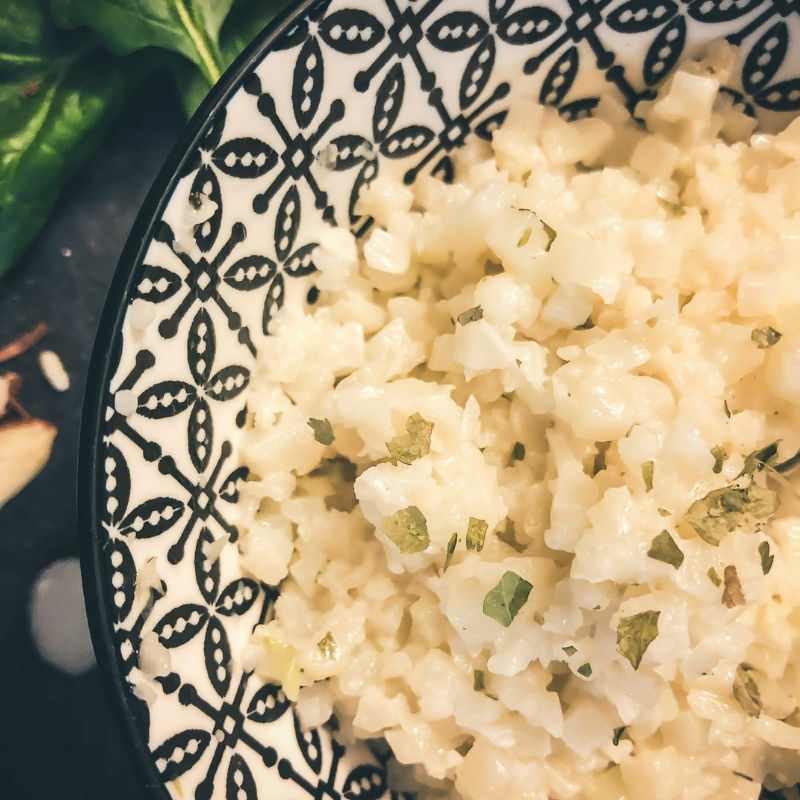 This coconut cauliflower rice recipe calls for just 5 ingredients: frozen cauliflower rice, coconut oil, coconut milk, cilantro, and salt. You could totally elevate it (fancy, chef talk) by adding a squeeze of lime or scallions. But, you totally don’t need to. What I love about this side, is infusing it with my favorite healthy fats: coconut oil and coconut milk. If you’re anything like me, you use coconut oil for everything – I put it in my coffee, apply it to cuts and scrapes and often use it as a butter substitute in baking. Coconut oil is incredibly good for you and your brain, thanks to medium chain triglycerides (MCTs) – which, through the liver, are converted to energy and ketones (hello brain power!). Coconut milk carries many of the same health benefits as coconut oil – just make sure you get the straight up, unsweetened version. 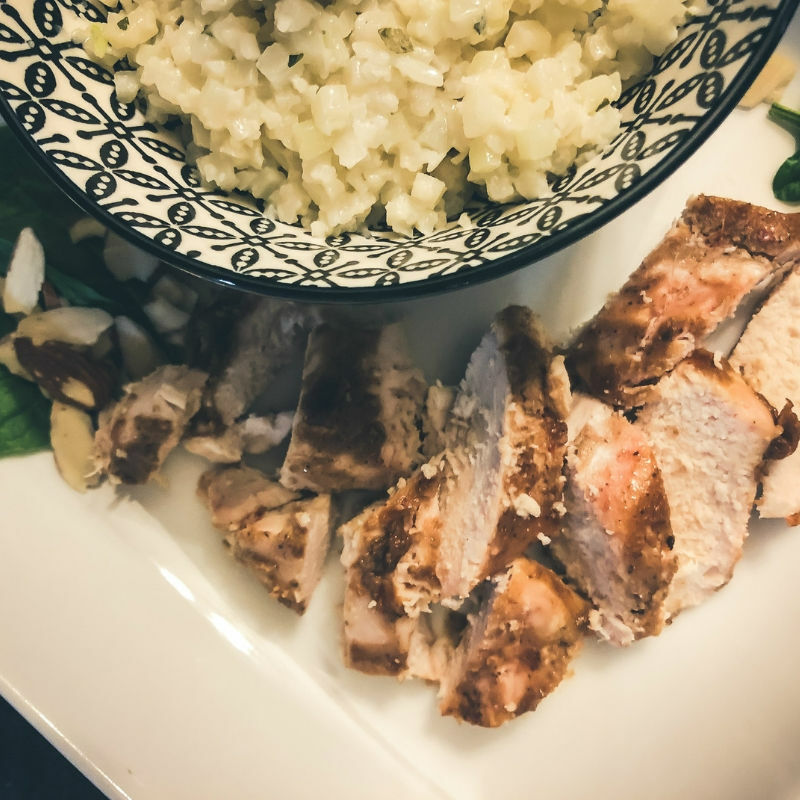 For this coconut cauliflower rice recipe, I use coconut milk in the can. 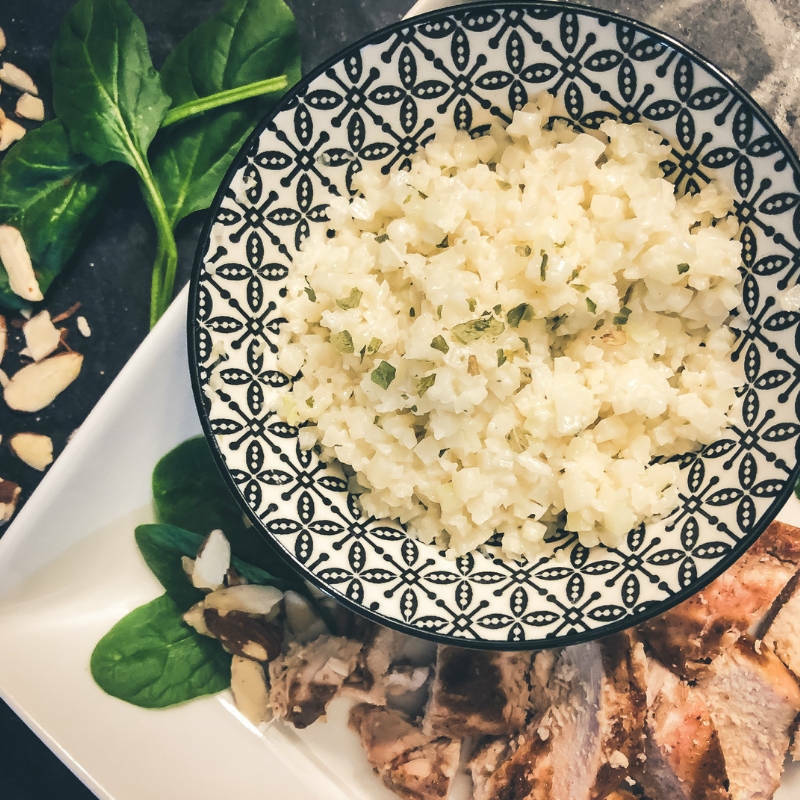 If you’re roasting chicken or other veggies for meal prep lunches, this coconut cauliflower rice is a super flavorful companion. 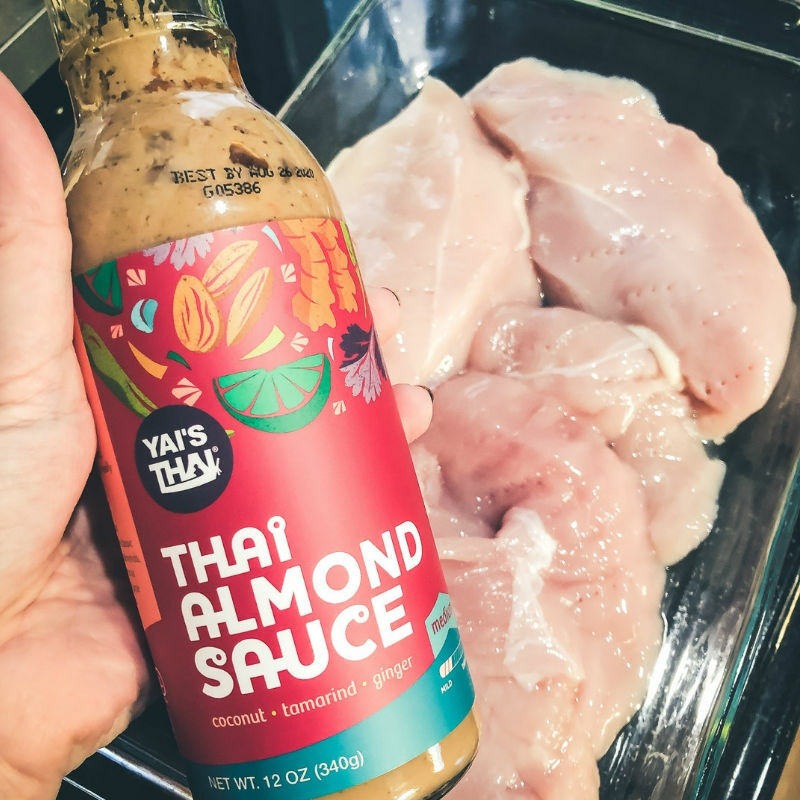 We had some of this Thai Almond sauce from Thrive Market and roasted our chicken with it for Monday / Wednesday lunches. 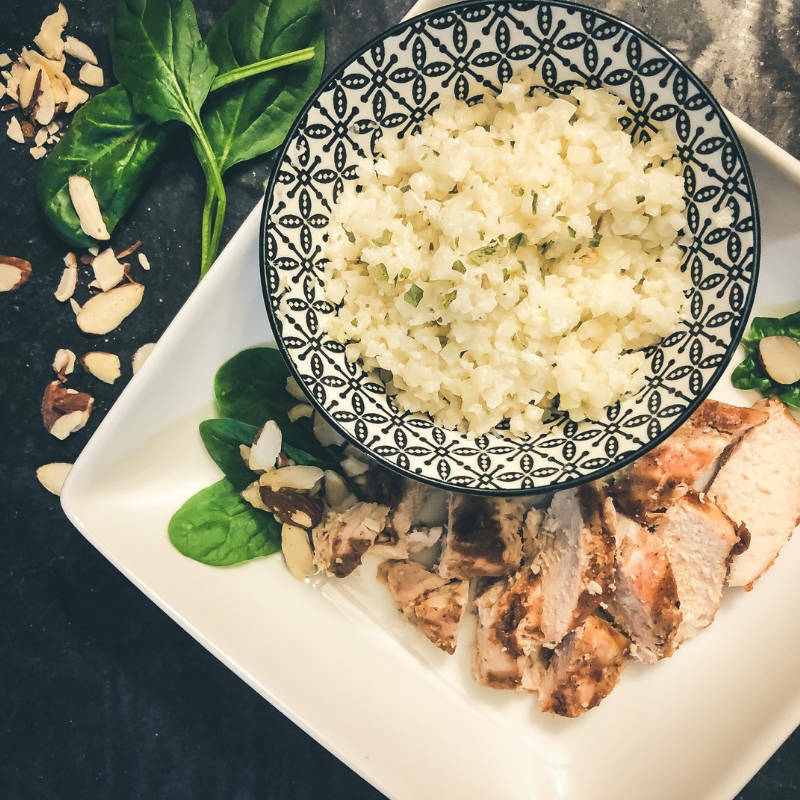 We became quickly obsessed with the dish, not only because it was easy, but it tasted just like a Thai dish we would’ve ordered before changing our diets last year – except this didn’t have any sugar, grains or bad stuff! This super easy recipe is below – it will take you less than 10 minutes to prepare! 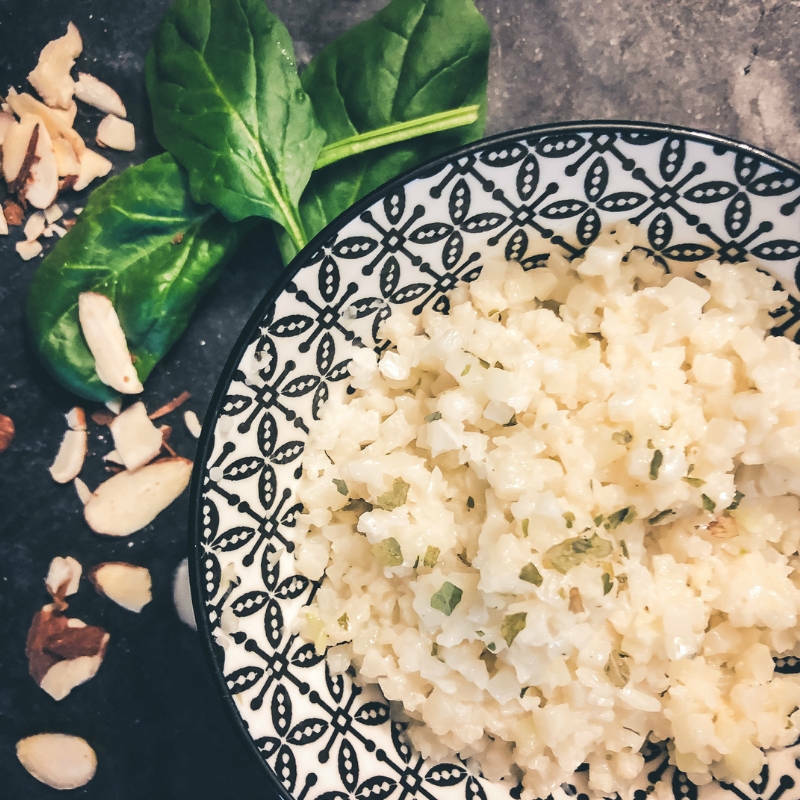 This 10-minute coconut cauliflower rice is sugar-free, dairy-free, gluten-free, grain-free and incredibly addicting. We make it for quick dinners or meal prep lunches! Once done (and when steaming), pour into a medium size bowl and immediately mix in the coconut oil and coconut milk so it melts (both the coconut milk and oil will be in solid format but will melt when blended with steaming cauli rice). Mix in fresh or dried cilantro and salt / pepper (to your own taste). Enjoy!